This Series has VERY little resemblance to what it originally started out as, both in content and development. The beginning concept being presented by the idea source was actually presenting verses of Scripture as “healing” verses. The reason for the change in approach is simple – we do NOT command the Lord, our Creator God or the Holy Spirit to “do” anything. 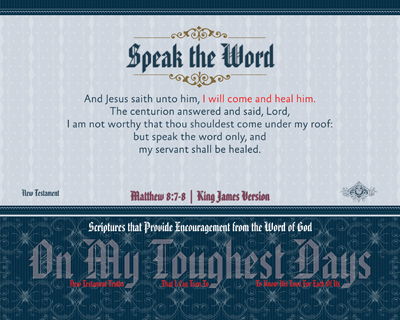 A vast majority of the Scripture presented as the “case” were taken out of context and chosen because they presented an individual in dire need of healing by miraculous means, but failed to recognize why those words were used. Our definition of “healing” is considerably different that what the Bible teaches. Much of the challenge of “healing” was and is tied to Faith. An often used verse is Matthew 17:20, with the comparison of the “faith of a mustard seed” (our English vernacular). Jesus says it is because of the lack of belief that things were not accomplished. Notice also that His Faith description is “have”, an active and present tense Faith, not a “had”, stalled and past tense Faith. Even further noted in the Scripture passages, is the attitude and function of Service. It is abundantly clear that it is our recognition of Who He REALLY Is that makes those passages of Scripture come to life, as they were presented in those people’s lives given to us in the Bible. Each of the passages, whether it be Old or New Testament, have a specific instruction set and/or reception requirement. REMEMBER – the “have” rather than “had” explanation. The words are active, as in “diligently”, “serve”, “forgive”, “give”, “bless”, “cry”… The list goes on and on as reminders to us that God our Creator is ACTIVE, not PASSIVE. Most of those actions are things we SHOULD be doing in our daily Christian lives as we seek to please Him in all that we do, where we go and how we do things in light of Him being placed first in our lives..
And Jesus saith unto him, I will come and heal him. The centurion answered and said, Lord, I am not worthy that thou shouldest come under my roof: but speak the word only, and my servant shall be healed. It is good for us to have the pieces, but more perfect for us to understand what we are asking, seeking or to whom we are making petition. Little would someone realize the importance of the “other stuff” if they have NO idea what they are repeating. We are to understand the Word, be in the Word and have the Word in US! The Lord Jesus Christ healed the Servant because of his Master’s Belief – as strong as he Believed, would be as strong as the Healing. There were three people involved, NOT two and certainly NOT one. This Series is about Encouraging ourselves through the reading of God’s Word in specific incidences, not just row-repeating Scriptures in the thought they are like a magic potion that will cure this or that. IF that were so, doesn’t it stand to reason that Paul would have been cured/healed and he would have healed every individual he came in contact with? Have to be careful here, because he actually did offer to everyone the cure of the Ages – the Messiah, if they would only Believe. This Series really caused me to focus on how my challenges physically have changed how things are done and my approach to challenges, difficulties and problems. Through the changes in medication regiments, pain management treatments and hospital stays to get it back under some form of control – there has been ONE constant – my Faith. The Believing that my Saviour would never leave me and is the One in control of my life. The One thing that I have had desire of, no matter where, when or the circumstance – is to sing, read, hear, share, write about how GOOD He is to me. If every person could just repeat some Scripture and be healed, how would those that are the care givers, medical providers and services coordinators going to see “proof-in-the-pudding” examples as has been done in my life? On those days when others have to care for me, these are some of the stories that can be shared with them such they might come to understand how Marvelous, Kind, Gracious, Merciful and Powerful my God REALLY IS! Who needs to see your reflecting of Christ in your life as they see you battle some of things that might hinder you? Will they say “He must be a Christian… because….” about your life? If not, or even if so, there are twenty-three examples are used in this Series for each of us to be reminded of His Goodness, especially on those “tough” days. This Series was started some nine (9) months ago as a research topic/item for the word “UNTO” to go with the starting passage of Scripture in Psalm 105. 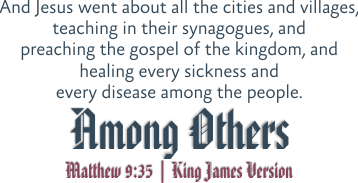 Besides the mind boggling 9,003 references for the word “unto”, it was of interest that the ENTIRE Bible has that word used in it – all sixty-six (66) books. That is NOT what this Series has in it! Reading them in that manner, leads us to an understanding in just eight verses of how much we really can depend on Him for in our lives. It is a stepping stone planner set before us to engage, show love toward, to be in adoration of and reminder that we desperately need HIM. Keep in mind, this is but a “short list” of things we need to be aware. Along with beauty that our Heavenly Father has on display for us in His perfectly created world before we messed it up with sin, He also gave us His Word – which we not only should be thankful for, but LIVING it for Him. 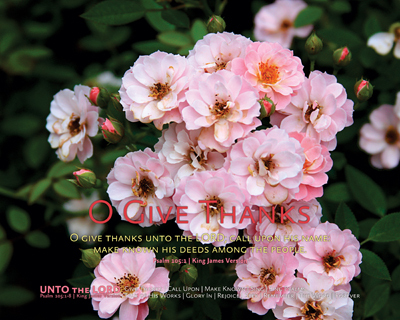 Our daily lives are those things when we draw close to Him – these eight (8) verses are provided to remind us. This Series has been developed from the first eight (8) verses of Psalm 105 which remind us of the Forever Covenant promised which we as Christians have benefit of today. How often are we able to take the Bible and directly apply it to our daily lives? If the answer is rarely, then I’ve some VERY uncomfortable news to share with you… Something is wrong with your daily walk – which should include reading/studying God’s Word, along with prayer, meditation on His Word, daily Worship, godly music, a devotion which provides a Christ-like awareness and reflection in/around you… These are just a FEW of those things we should have in our lives, our growth, our maturity and our witness. God’s Word is designed to provide soul searching, conviction by the Holy Spirit and to change us from the inside out. The pressure by the world on the outside is why we cannot change from the outside to others on the outside – all they see is what they have seen and know already. As the Word is read, our hearts and minds are changed, as will our spirit also change – that Spirit resides inside of us. In order for that Spirit to reflect in the most effective manner is for us to give God His Place, realizing Who Jesus Is, what He has done for each of us – only then will our reflection over-power the wickedness of the world, allowing for the Light of Christ shine such that others would come to know Him, and Give Thanks UNTO the LORD! Am reminded over and over again that what one person is experiencing cannot be used as a yardstick, so to speak, to compare to what another person is going through – emotionally, psychologically, spiritually, physically – or what is most likely the case – all of them. Oftentimes people are just trying to be kind and understanding in their own manner when they say “compared to what you suffer, I should not be saying anything at all” or something close to that, not realizing that just might be making that person feel a bit embarrassed for even saying anything to begin with. Then of course there are the times when we discover, quite to our shock, when a person is in dire straights before we may recognize there is any difficulty being experienced in the first place. There usually seems to be two extremes in this area of difficulty recognition, one where EVERY ONE knows about the difficulties, or where NO ONE knows of the challenges faced by the individual in living, daily, hourly and even moment-by-moment. Those kinds of difficulties can lead to despair, depression and even despondency in a person given their situation and place in life. We as Christians are NOT immune to these challenges in life, but we do have something the world doesn’t have – we have God’s Promise to help us. He made the promise to Save us, if we would only Believe and Trust on His Son for Salvation. He also made the Promise to never leave nor forsake us, once we are His. But, did you realize that even through our pain and suffering, He has Promises made to us too? Do You See His Promise? In whom ye also trusted, after that ye heard the word of truth, the gospel of your salvation: in whom also after that ye believed, ye were sealed with that Holy Spirit of Promise which is the earnest of our inheritance until the redemption of the purchased possession, unto the Praise of His Glory. For those who Believe that Jesus Christ is the Lord and have accepted God’s Son as Saviour, seeing His Promise is a matter of Trust. Of course, reading about those matters in the Bible SURE does go a LONG way toward being able to be at Peace with whatever comes our direction. 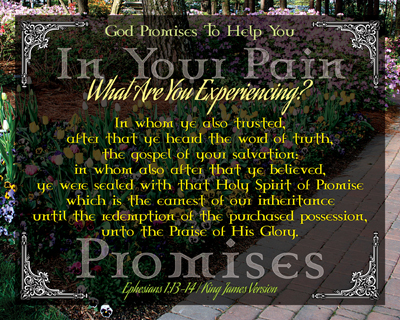 What is stated in Ephesians previously is that we can Trust Him for Salvation, His Glory will show through in our lives by way of what we are experiencing. This Series actually is a formula of sorts which expands on what His Promises are to us – the secret is in the “reading” and “taking to heart” those things which are Promised to us as His Children. There are seven (7) passages of Scripture presented in this Series which describe what specific Promises that God the Father gives us individually and collectively, especially important when the world is trying to tell us that having challenges in our lives must be coming from our lack of Faith. For my very own situation and those that are known of those who are close to me, God’s Word is a comfort, reminder and Encouragement. Sometimes I do wonder how people go through their daily lives with such seeming struggle, but yet appear each time to come out on top the victor and praising the Creator’s name. I want that person who shows such courage, love and vitality to be ME – it can be and is when the Person of Jesus Christ is High and Lifted UP in my life, instead of focusing on any individual trial or tribulation. Leaning on the Promises of my Saviour is what causes me to keep going! What is it Christian that keeps you moving? And sharing? And telling? And rejoicing? Are these SPECIFIC Promises ones you claim as your own? If not, why not? Ask Him from His Word – He Promises to Listen to you and Help you. This Series actually started in a manner very different than the “bee” in the first print, which of course is CUTE in its own right! The original direction came from a challenge a counselor gave a couple seeking assistance with each other of being overly critical of each other. The activity given was to look into the Bible to find references about criticism. While there is not a direct reference to the word “criticism” in the Bible, there are plenty of items where we can go as Christians need to take a critical look toward. The original “assignment” was a tough one for the couple because they were not quite ready to be handed the task which has zero actual hits. 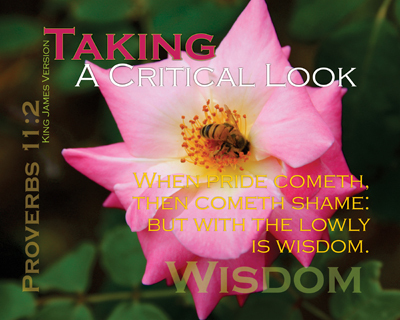 For the purpose of this Series, an absolute phenomenal change occurred when the word “criticism” turned into “Taking A Critical Look”. The difference allows for us to explore a new view which our Heavenly Father has provided in His Word, to look at things we may consider common sense, that is because they are! An interesting find of a portion of the “critical” items found in God’s Word, the Bible, yielded eighteen (18) points for us to make a part of our lives in dealing with those things we incur in our daily walk of life.